How can we strengthen recruitment using a design approach? Like many humanitarian organizations, Doctor Without Borders (MSF) recruit field officers to go on international missions abroad. Over the course of the past year, MSF faced a lower number of candidate applications. 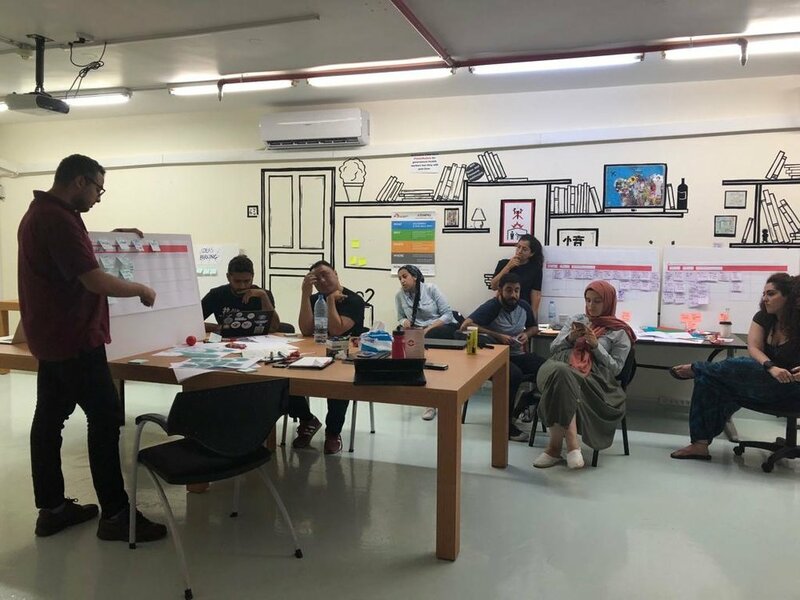 The HR and Communication departments in MSF Lebanon and Egypt identified this problem as a design challenge and we embarked on a mission to solve it. Using a Human-Centered approach, I started by immersing myself in the MSF offices to firstly understand the organization’s culture, and why people join it. Second, Using a “7mn storytelling booth” I collected stories that gave us an initial understanding of the motivations behind joining a humanitarian organization like MSF. This was followed by in-depth interviews (around 45mn each) with field officers on their missions, as well as interviews with field officers from other organizations, and a mapping of the recruitment process. Insights collected from this process led us to reformulate the challenge and led to the main design sprint that gathered different stakeholders for ideation. Four principles were applied to the study, based on the Behavioral Science Toolkit. Anchoring - The first fact, number or figure the person hears or reads will bias their judgments and decisions down the line. Default Bias - People pick the easiest option to avoid complex decisions, and they get lost if they have too many choices. Friction costs - People can be deterred from taking action by seemingly small barriers. Social Proof - People want to be like everyone else and are heavily influenced by what they perceive others are doing. People don’t think of joining Doctors Without Borders as a career. It is believed that MSF is a volunteer based organization. The Lebanese branch has been only operational for a year, although the organization has been active for about 40 years in the region. Post-events is the highest traffic on the website. However, these visits get lost because of lack of segmentation of contacts, and because of high friction on the website. Based on our newly formulated problem, we held a design sprint with different stakeholders: Mission officers, staff from the communications department, and from the HR department. We developed persona groups to make ideation more tangible and walked through mapping out journey maps to identify the recruitment’s process’ main pain points. Three main verticals were identified: Designing a short-term end of year push campaign; eliminating friction from the website; and building long term engagements and partnerships. The goal of the campaign is to build awareness for MSF, their work in numbers, leveraging their history and their values. This was done through a concentrated series of posts, posters, leaflets and a collaboration with a local coffee shop to disseminate messages on the coffee cup sleeves. While the website strategy is still being put in place, we put in place 9 building blocks for long term engagement and building partnerships that bring people to the MSF community and strengthening recruitment. 1- Community Building - Employee referrals, Ambassadorship program, Regular sharing and webinars. 2- Brand development - Leveraging history, impact and values, communicating about independence. 5- Designing Triggers - Building inspiration through one on one communication with field officers.